Yesterday Bellator MMA confirmed that a huge announcement about a hybrid MMA/kickboxing event with GLORY was coming prior to tonight’s (Fri., June 19, 2015) Bellator 138 from St. Louis, and apparently they weren’t lying. 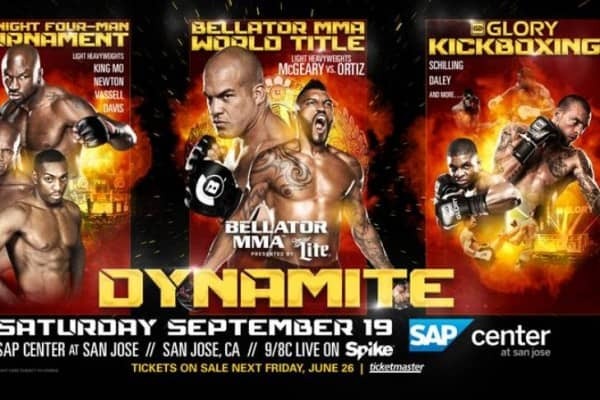 The promotion announced that the event, which will be deemed ‘Dynamite’ to honor hybrid MMA/kickboxing from Japan, will take place on September 19 from San Jose’s SAP Center and will feature light heavyweight champion Liam McGeary putting his title on the line against former UFC light heavyweight champion Tito Ortiz. Also set to take place at the event is a promising four-man, one-night light heavyweight tournament to determine the next challenger at the winner of the main event with new free agent signee Phil Davis taking part against Muhammad Lawal, former champion Emanuel Newton, and Linton Vassell. As for the kickboxing portion of the event, three GLORY matches featuring explosive strikers Joe Schilling and Paul Daley will also take place on the card. To facilitate such an event, both a cage and a ring will be present. 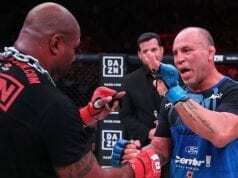 For his part, Bellator MMA President Scott Coker said that the first round of the light heavyweight tourney will feature two five-minute rounds while the second round will feature the normally seen three five-minute rounds, with alternate bouts also being held to cover any potential injuries to the main fighters. No match-ups for the tournament have been officially announced as of yet. And that’s just how it’s going to be for Bellator and GLORY this September. It’s shaping up to be an exciting and innovative night from San Jose. What are your thoughts on this new and exciting format? NEXT: Was Kimbo Slice vs. Ken Shamrock Fixed?